An on-again, off-again feature of this blog is “I Ate It (So You Don’t Have To),” wherein I subject myself to various shady burger experiences in hopes of stopping you, the innocent reader, from making a major culinary mistake. This post, however, is a little different. 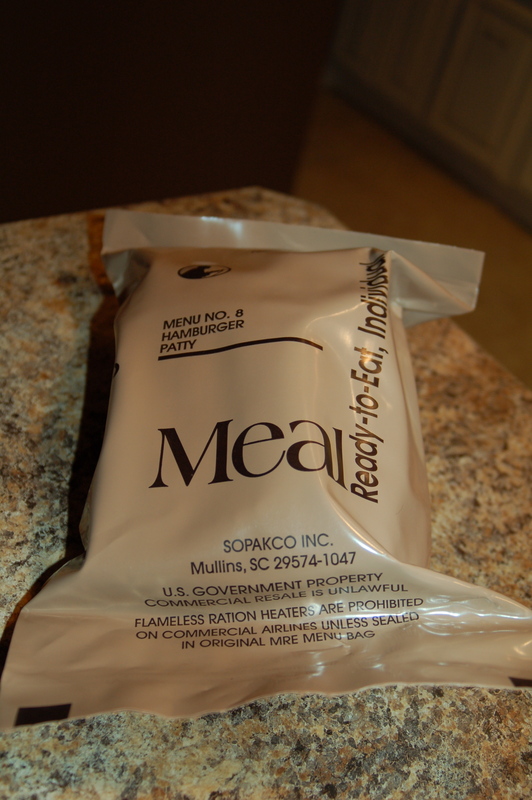 Thanks to the wonders of the Internet I was able to procure perhaps the rarest burger of all – a MRE (Meals Ready to Eat) Burger. The “They” of course are our troops who are fearlessly in harms way, and for whom a trip to the latest burger joint featured on this or other sites is frankly impossible. 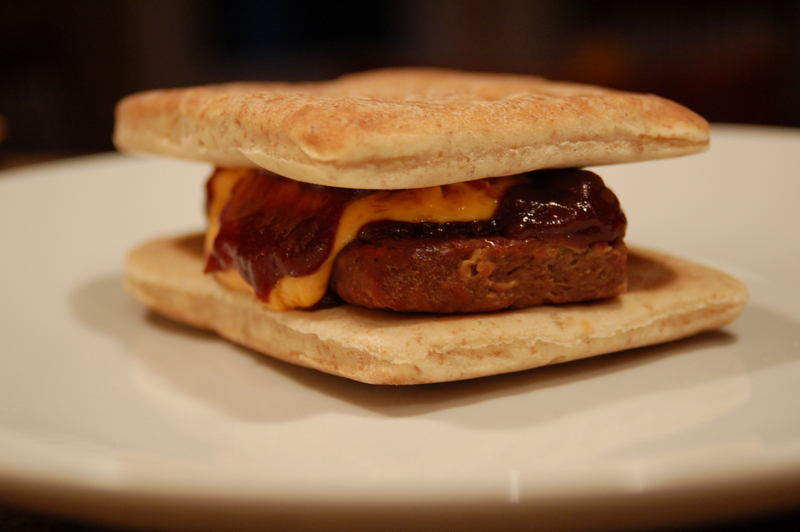 So in a nod to patriotism, here is a quick post on the making and eating of a MRE Hamburger. 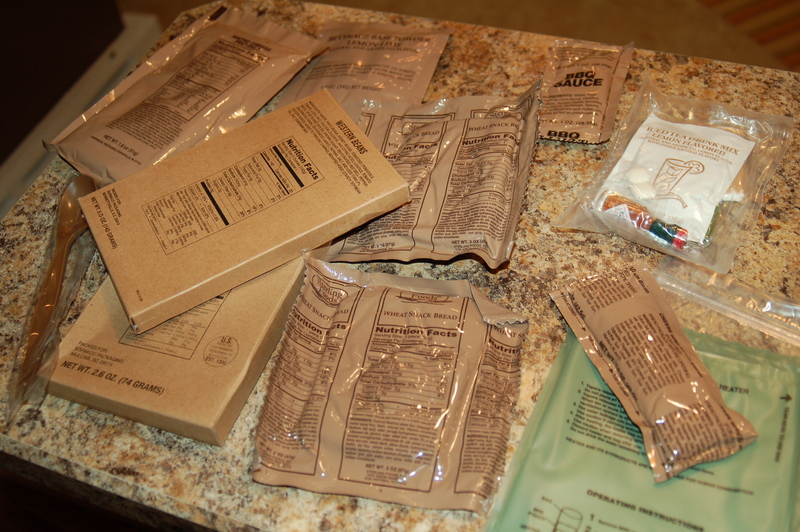 First of all, I had no idea how big an MRE packet would be. This set was fairly sizeable and featured a complete meal + snacks and drink mixes as well as a cooking pouch that is scary efficient and a couple of chicklet style pieces of gum to freshen up with after the meal. I’m not sure how many packs a soldier could conceivably carry at one time, but it can’t be too many (they don’t weigh much, but they are bulky…about the size of a shoe box) and so the stories of supply convoys cruising the desert become even more realistic when you think about how often the troops would need to be resupplied. The idea behind a flameless heater is to use the oxidation of a metal to generate heat. Magnesium metal works better than iron because it rusts much more quickly. To make a flameless heater, magnesium dust is mixed with salt and a little iron dust in a thin, flexible pad about the size of a playing card. To activate the heater, a soldier adds a little water. Within seconds the flameless heater reaches the boiling point and is bubbling and steaming. 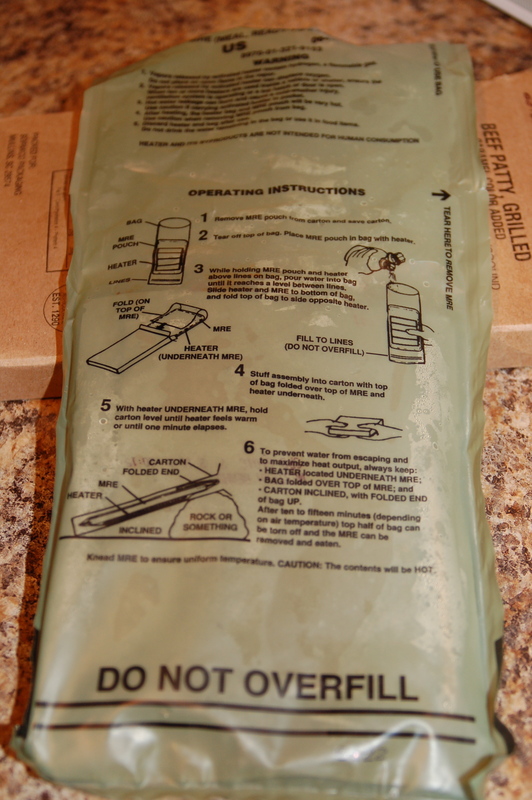 To heat the meal, the soldier simply inserts the heater and the MRE pouch back in the box that the pouch came in. Ten minutes later, dinner is served! And so it was that 10 minutes later the burger patty was ready. The kit included 2 slices of “Wheat Snack Bread” which are vacuum packed and though not bakery fresh weren’t too worse for the wear when we opened them. I applied the bacon cheese spread (mmmmm, bacon! ), BBQ sauce and a few dashes of the smallest bottle of Tabasco sauce you have ever seen and I was ready to take a test bite. Here is where things could go horribly awry with this post. If I told you it tasted great you would think I was nuts and maybe even some real soldiers would write in and offer to switch places with me if I liked the darn thing so much, so I’ll shy away from the word “great.” But, to be honest, it wasn’t bad. Now, if I had the choice of a burger at Good Dog or the Shake Shack I’d have to go with them, but if I was looking for a burger experience, in a part of the world completely devoid of burger options (and in a situation where eating is not for enjoyment but rather for fuel for my job) this one would do the trick. The burger box has the phrase “Military Rations Are Good Performance Meals” and these meals are high in calories and carbs. The burger patty itself (2.6 oz) has 150 calories and 13 grams of protein. What I thought was really interesting was that they are Trans Fat free (!!) and the ingredient list was shorter than the Oscar Mayer Lunchables that I reveiewed a few weeks back. The government seems to understand (in this case) the damage that can be done by partially hydrogenated oils and needless chemicals. The burger has only 8 ingredients (including soy) and the most difficult word on the box is (sodium) phosphate, a shelf-life enabler. Served with the included Iced Tea (lemon flavored) and some knock-off Nacho Cheese Combos (I forgot how good Combos taste…I can still remember when they were introduced – they seemed so mysterious) I enjoyed a pretty nice dinner (at my comfy dining room table). Without getting too preachy, thanks to the troops that eat this stuff on a regular basis (I am sure my feelings about it would change the 100th time I ate one). May G-d keep you safe and return you home soon so you can enjoy a real burger (and a beer! ).